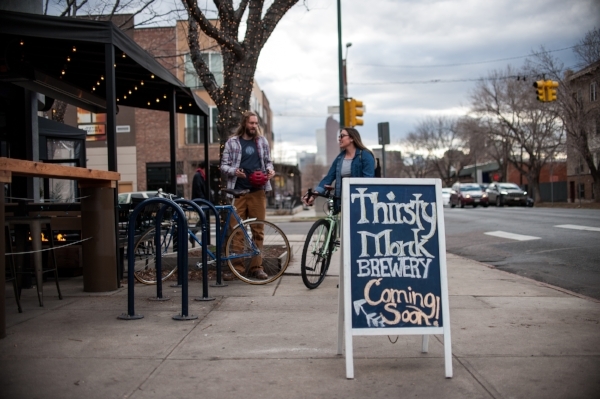 DENVER, CO— Thirsty Monk, brewer of Belgian-Rooted Modern Ales and operator of world-recognized craft beer bars, opens its greatly anticipated Denver brewery and tasting room Monday in City Park West. This Denver opening comes with the launch of Thirsty Monk’s Food Flights, selections of small, snack-sized portions expertly curated by Certified Cicerones® to pair perfectly with your chosen beer style. Thirsty Monk offers six Food Flights— Belgian, Light, Medium, Dark, Sour, and Hoppy— in an elevated box lunch-style presentation that includes four food items (a protein, a cheese, a grain, and a preserve) sourced from Uptown neighborhood restaurant partners, including Humboldt Farm, Fish, Wine; Patxi's Pizza; Jack's Uptown Grille; and Olive & Finch. On draft currently are Thirsty Monk’s flagship lineup of Belgian-Rooted Modern Ales that includes Abby Blonde, Past Life Amber Ale, Screaming Monk IPA, Clever Monk Saison, Wiser Monk Table Beer, and Easy Gose among others. Thirsty Monk Head Brewer Brian Grace, based in Denver, has been helping connect the Colorado and Asheville craft beer magics to further elevate Thirsty Monk’s quality beer offerings, and is hard at work designing the brewery’s new upcoming sour and barrel-aged programs. “There is a such a strong Colorado - Asheville connection bound by beer. As several Colorado breweries have chosen to make the Asheville area their second home, Thirsty Monk is thrilled to be the first North Carolina brewery to make Colorado its second home. And Denver’s City Park neighborhood now truly does feel like my personal second home. This is absolutely where I would live,” says Barry Bialik, Thirsty Monk CEO. Thirsty Monk is located in the former Deep Draft Brewing space along Restaurant Row at 1604 E 17th Avenue. The brewpub will celebrate its grand opening on Monday, March 26 at 4pm. Regular hours will be Monday - Thursday 4pm to midnight; Friday - Saturday noon to 1:30am; and Sundays noon to 10pm. For more information about Thirsty Monk contact Emily Hutto at coop@radcraftbeer.com. Founded in 2008 Thirsty Monk currently operates four locations in Asheville, North Carolina including Thirsty Monk Downtown, Thirsty Monk Biltmore Park, Top of the Monk Craft Cocktail Bar, Brother Joe’s Coffee Pub, as well as Bazi Bierbrasserie in Portland, OR and now its Denver brewery and tasting room. Find the company online at monkpub.com.